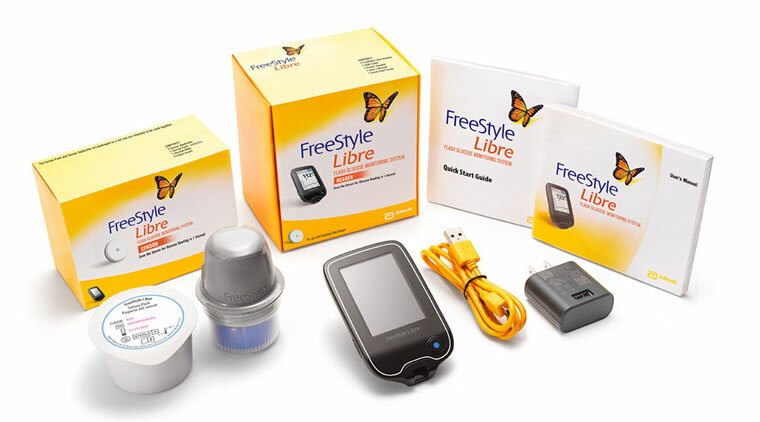 The Abbott FreeStyle Libre has come as an entirely new concept in glucose monitoring by providing much greater data than blood glucose testing whilst being more affordable than continuous glucose monitors (CGM). The FreeStyle Libre provides ‘flash glucose monitoring’ with glucose readings provided by scanning a sensor rather than pricking your finger. What are the benefits of FreeStyle Libre? The FreeStyle Libre works by having a small round sensor applied to your arm. The sensor is a round disc, 5mm high and 35mm diameter, making it roughly the size of a £2 coin. The sensor is applied to the skin with a handheld applicator and then lasts for 14 days. Most people that were used in patient trials of the Libre rated the application of the sensor as being painless. Within the 14 days of usage, the sensor allows you to scan the sensor with the handset which sends data of your sugar levels over the previous 8 hours to the Libre system’s handset. When you scan, you therefore get not just a glucose reading, as you would with a blood glucose meter, but can also see whether your sugar levels are starting to go up, down or are stable. How much does the FreeStyle Libre cost? The one feature that CGMs have that the FreeStyle Libre most notably lacks is that it cannot alert you when glucose levels are going too low. However, the much lower price tag for the Libre means that some people will not be put off buying the Libre despite lacking the alerts. Note that the sensor provides a glucose level reading not by measuring the level of glucose in the blood but the level of glucose in interstitial fluid, fluid in the body which acts as a reservoir of nutrients, including glucose, for your body’s cells. This is the same method of measuring sugar levels that continuous glucose monitors use. Whilst the sugar levels provided by readings from interstitial fluid are largely a close match for blood sugar readings, there will sometimes be differences. The differences should not be large but may be significant at lower levels. For this reason, it is advisable to carry out some blood glucose tests during the day to check for accuracy and to do a blood test if you think you may be hypo. Freestyle Libre rather than CGM?